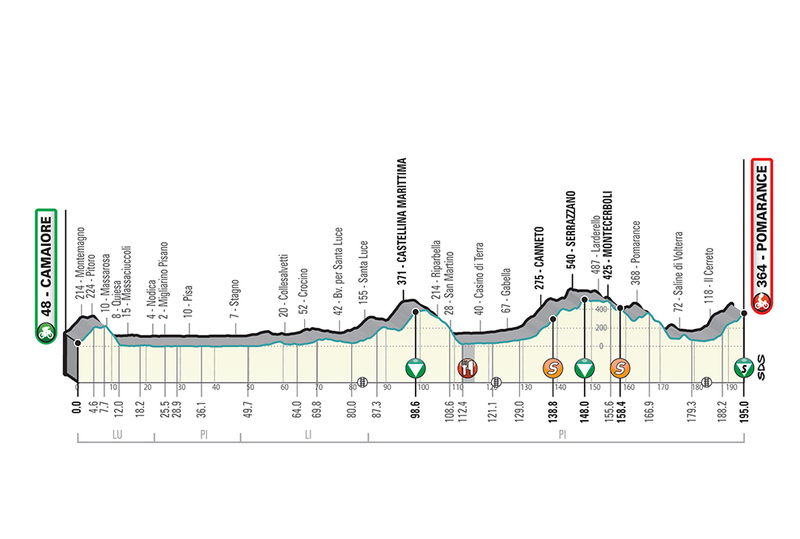 Hello and welcome to stage 2 of the 2019 Tirreno-Adriatico. 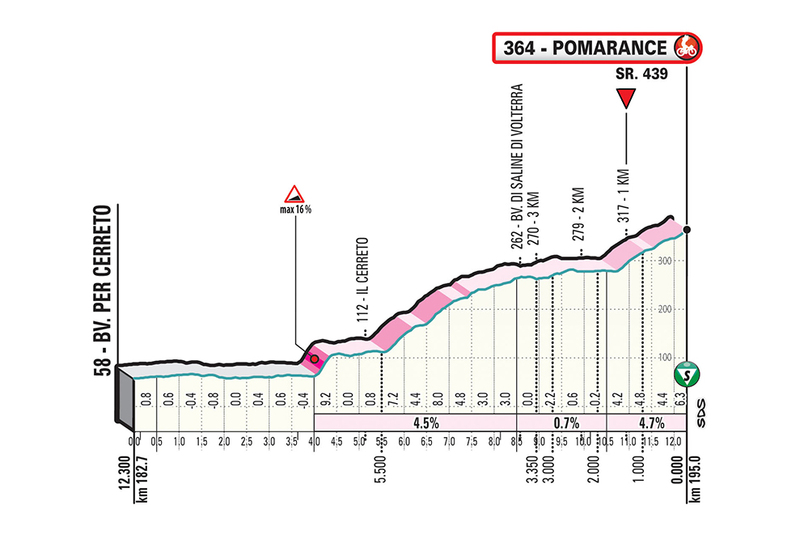 Today's stage is the first road stage of the race and runs 195km from Camaiore to the uphill finish at Pomarance. We're around ten minutes from the start of today's stage. At nearly 200km it's a long one but is only the third-longest of the race, with two stages measuring in at over 220km coming up in the next two days. It may be the first road stage, but it's not one for the sprinters. The irregular 6.8km final climb should see to that. Two other classified climbs and two intermediate sprint points come earlier the stage, but still packed into the second half of the day. Here's an early look at today's finale. The climb is tough in places, but a 3km flat section slap-bang in the middle should mean that we'll see a fairly large group contest the closing stages. The riders will be heading off now. From the off there's a hill to navigate (4.6km at 3.5%) before around 80km of flat roads. Yesterday's opening team time trial saw Mitchelton-Scott take the victory, beating Jumbo-Visma and Team Sunweb by 7 and 22 seconds respectively. Michael Hepburn wears the leader's blue jersey today, while his teammate Adam Yates is in the driving seat as far as the overall GC push goes. Primož Roglič (Jumbo-Visma) and Tom Dumoulin (Team Sunweb) are the other big names on the top three teams from yesterday. The opening TTT in Lido di Camaiore was overshadowed by a crash involving Bora-Hansgrohe, with Rafał Majka and Oscar Gatto both hitting the deck after a pedestrian crossed the road in front of them. Both riders were fine to take the start today, while the pedestrian is reportedly not in a life-threatening condition. The German team went on to finish 20th on the stage, losing just under 2 minutes to Mitchelton-Scott. Majka and Gatto, meanwhile, lie over 5 minutes down on GC after the crash. After a 10km a group has broken away and are 4 minutes up the road. According to Velon's live tracking, the break is Markel Irizar (Trek-Segafredo), Stepan Kurianov (Gazprom-RusVelo), Mirco Maestri (Bardiani-CSF) and Sebastian Schönberger (Neri Sottoli-Selle Italia). That's not an official confirmation though, so we'll update as we get it. Natnael Berhane (Cofidis) is also in the breakaway. The riders on a pan flat section of the stage right now. They've bypassed the hills around Lucca – a popular pro base – and are heading south towards Pisa and Livorno, before continuing south to the hills. Around 3 minutes separate the break and the peloton now. Now the gap is out to 3:45. Deceuninck-Quick Step are known for their Twitter trivia during races, and they're taking advantage of this quiet period of the stage to dole out some Pisa facts. More than 50km of the race has gone and the peloton are 4 minutes back on the break. While today's stage isn't one for the sprinters, there are a couple coming up – tomorrow and on Monday's stage 6. All the more bizarre then, that Nacer Bouhanni (Cofidis) is out of the race already. He missed the time cut during yesterday's team time trial. Read the full story here. Trek-Segafredo's veteran Markel Irizar is in the breakaway today. He is due to retire later this season after 16 years as a professional. We spoke to him about building a lengthy career as a domestique, and much more. After just over 60km of racing, the gap is still stable at around 3:45. The break is reaching the end of the flat section now. It won't be too long until they're on the first climb of the day, the Castellina Marittima (3.9km at 4.9%). And now the break is on the lower slopes of the climb. The gap is still holding steady. Under 100km to the finish now and the break is still heading uphill. Berhane led the way over the climb. Schönberger, Bresciani and Irizar were next over the line. Still just over 4 minutes for the break at the moment. The peloton is currently being led by Mitchelton-Scott. They've just gone through the feed zone. As the break approaches the first sprint of the day at Canneto, the gap remains the same. Jumbo-Visma are also at the front of the peloton with Mitchelton-Scott now. Otherwise very little is changing on the road. Maestri took the intermediate sprint. He led Schönberger, Kurianov and Irizar over the line. Team Sunweb have also moved up towards the front of the peloton. Mitchelton-Scott are still taking on the bulk of the work, however. The five men up front are still all together. They're approaching the top of the next climb at Serrazzano now. Berhane wins the sprint for the points at the top of the climb. He beats Schönberger to the line and will wear the jersey of the mountain classification leader tomorrow. Irizar and Maestri were third and fourth on the climb. Approaching the final 40km of the day and still the gap is hovering at around the 3:45 mark. Still Mitchelton-Scott working largely alone up front. Eduard Prades (Movistar) goes down in the peloton after a touch of wheels. He's quickly back up on his bike though. Nobody else hit the deck. A bit of a cut on the right wrist and shoulder for Prades. The break fight over the intermediate sprint. Schönberger led the way with Maestri taking over and just edging out the Neri Sottoli man. Kurianov took third. Maestri will be leading that classification tomorrow. Schönberger is the runner-up in both the mountain and intermediate sprint classification today. The gap is down to three minutes now. The break is back together after the sprint. Meanwhile, Sky have joined in the fun at the head of the peloton. Gianni Moscon (Sky) has abandoned the race. More as we get it. Possibly an illness? Under two minutes now for the break. Peter Sagan drops back from the peloton with a technical. Deceuninck-Quick Step are putting the pressure on at the front of the peloton, lining it out. Quick Step have Julian Alaphiliippe as their main option today. The break will soon be brought back now. The gap has quickly evaporated. A reminder of the final kilometres. Just ten seconds for the break now. And the break is caught. Sagan drops off the back of the peloton. So that's him and Moscon out of contention for the win. Rafał Majka, who crashed yesterday, is with his teammate. CCC and Mitchelton are up front now. Several riders from other teams are mixed in up there too. 2km until the start of the climb – and the double-digit gradients at the bottom. Mitchelton lead it into the climb. The first 500 metres topped out at 16% and now the peloton are back on the flat for a kilometre. Then it kicks back up for 2km before easing off for 3km and rearing back up again for the final 2.5km. Mitchelton, Astana and CCC are on the front. No attacks as of yet. Daniel Oss (Bora-Hansgrohe) launches off the front. No reaction from the peloton yet. They're heading uphill again now, though the gradient isn't too taxing. Fernando Gaviria (UAE Team Emirates) is dropped. Adam Yates (Mitchelton-Scott) is second wheel. We're pretty much waiting for his attack now. Oss was caught and has been spat out the back. Kasper Asgreen (Deceuninck-Quick Step) briefly tries to get away but the Mitchelton-Scott pace is too high. He slots in at the head of the peloton. Jakob Fuglsang (Astana) counters with teammate Alexey Lutsenko on his wheel. Eight men have broken away from the peloton now. Primož Roglič (Jumbo-Visma) has gone on the attack! Lutsenko leads the chase with Simon Clarke (EF Education First) on his wheel. Tom Dumoulin (Team Sunweb) is attempting to make it across too. No it's Clarke, Dumoulin, Lutsenko and Roglič up front. Zdeněk Štybar (Deceuninck-Quick Step) joins them. The five are brought back by the remains of the peloton now. Roglič is still trying to power it forward. He and Lutsenko have got a small gap, while Alaphilippe joins them. Once again the leaders are brought back. 800 metres to go. An elite group forms once again. It looks like Alaphilippe or Greg Van Avermaet (CCC Team) are odds-on to win this. Alaphilippe launches the sprint from second wheel. Van Avermaet reacts! The Dutchman can't get past Alaphilippe on the run to the line. Another win for the Quick Step man! Simon Clarke (EF Education First) took third. Fifth win of the season for Alaphilippe. Six if you count the points classification at Colombia 2.1. At the weekend he won Strade Bianche, while he also has two stages at the Vuelta a San Juan and one at Colombia 2.1 to his name in 2019. It was Alberto Bettiol, not Simon Clarke, in third. Tiesj Benoot (Lotto-Soudal) and Adam Yates (Mitchelton-Scott) were fourth and fifth. Adam Yates takes over the overall race lead. It's really incredible. I'm just so happy. I know that after yesterday's stage we lost a lot of time, so I try to win a stage. Today was a good opportunity so we control in the final with the team and everything was going my way like perfect. I pushed myself full gas until the line. I was surprised with me day after day and tomorrow is a good opportunity for Elia [Viviani] in the sprint as well. The race decided the tactic [between me and Štybar] but for sure we talked during the race. We had to jump together in the final if there were some attacks. There was a lot of attacks So Štyby was in the last group and in the end I just had to control behind and to do a good sprint when we caught the first group. We did really perfect, a really good job from all the team and I'm really happy to finish the day like that. That's the end of our live coverage for stage 2. Be sure to join us again for tomorrow's start-to-finish coverage!